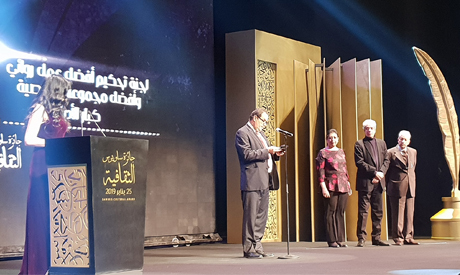 Sahar El-Mougy and Nadia Kamel jointly won the Sawiris Cultural Award for best novel by an established writer, with the winners announced at a lavish awards ceremony on Friday. The ceremony at the Main Hall of the Cairo Opera House attracted many Egyptian celebrities and big names fom the cultural scene. The hall was packed with attendees, who sat for three hours straight waiting for the winners to be announced. Novelist and critic El-Mougy won for her novel Mesk El-Tal (“The Musk of the Hill”) and director and author Kamel for her book Al-Mawlooda (“The Newborn”). There are awards for novelists, short-story writers, script-writers and playwrights. The ceremony was hosted by renowned Egyptian actress Yousra, who was also the guest of honour of the night. Samih Sawris asserted his commitment to the awards and paid tribute to the late Shams El-Etreby, the founder of the Cultural Awards, who passed away in 2017. Below is a full list of this year's winners. Ahmed Abou-Khenaigar for his collection Mashahed Abera Le Ragol Waheed (“Passing Scenes from the Life of a Lonely Man”). The judging panel for the established writers categories included Anwar Moghith, Rania Fathy, Mohamed Badawy, Mohamed Berery, and Hala Kamal. First: Ahmed El-Malawani for his novel Fabrika. Second: Ahmed Samir for his novel Kareban Min Al-Bahja (“Near to Joy”). First: Mohamed El-Hajj for his collection La Ahad Yarthy Ketat Al-Madina (“No One Cares about the City Cats”). Second: Noha Mahmoud for her collection Al-Galison Fil Soa Hatta Tagee Zeinab (“Those Who Are Sitting on the Balcony Waiting for Zeinab”). The judging panel for the emerging writers included Laila El-Rai, Ahmed El-Shamy, Karima Kamal, Magda Haroun and Walid El-Hamamsy. Hala Khalil for her scenario Salet El-Mahaba (“The Hall of Love”) and Wessam Soliman for the movie Banat Rosa (“Rosa's Daughters”). Youma Akram Khattab for her scenario Roqaya. The judging panel for this category included directors Samir Seif, Ahmed Amer, Amir Ramsis and screenwriters Hala Galal and Mariam Noam. First: Mahmoud Gamal for his play Cinema 30. Second: Sayed Ibrahim for his play Al-Faquih wal Faylashouf (“The Religious Scholar and the Philosopher”). Mohamed Talaat El-Gendy for his book The Revolutionary Vision in the Egyptian and Korean Novel. Mostafa Bayoumi Abdel-Salam for his book The Seduction of Reading: Preliminary Analysis. The judging panel for this category included former minister of culture Shaker Abdel-Hamid, Sahar Abdel-Hakim, Magda Hassab El-Naby, Hoda Ayyad and Faten Morsi.